One of the leading causes of the automotive accidents is distracted driving, this includes when a driver is attempting to have a conversation with the person in the back seat. In this scenario, they often find themselves having to turn their head away from the front of the car and towards the back seat in order to be heard. There are two main reasons why the driver has to take his eyes off the road to have a conversation. The first is noise, with the wind noise, tire noise and engine noise, the cabin of the vehicle is a noisy environment. This second reason is the high frequency speech information is lost when talker is not facing the listener. There is no direct path to the listener and higher frequencies have a larger absorption coefficient. Therefore, automakers are using existing hands-free communication systems and infotainment systems(for making phone calls, GPS, etc) in cars and using them for in-car communication, so the driver can keep his eyes on the road. Due to the aforementioned noise sources in car environments, speech enhancement algorithms are required to improve the intelligibility of the driver’s speech. However, in-car communication systems must be low latency. Any delays greater than 10ms will be perceptible and interpreted as echo by the users. Speech enhancement algorithms must be performed in the time domain, eliminating the use of block processing typical of noise reduction algorithms. In order to circumvent this problem, the noise reduction filter can still be calculated in the frequency domain, but it must be converted to time domain. The figure below shows a block diagram of a time domain implementation of the speech enhancement. 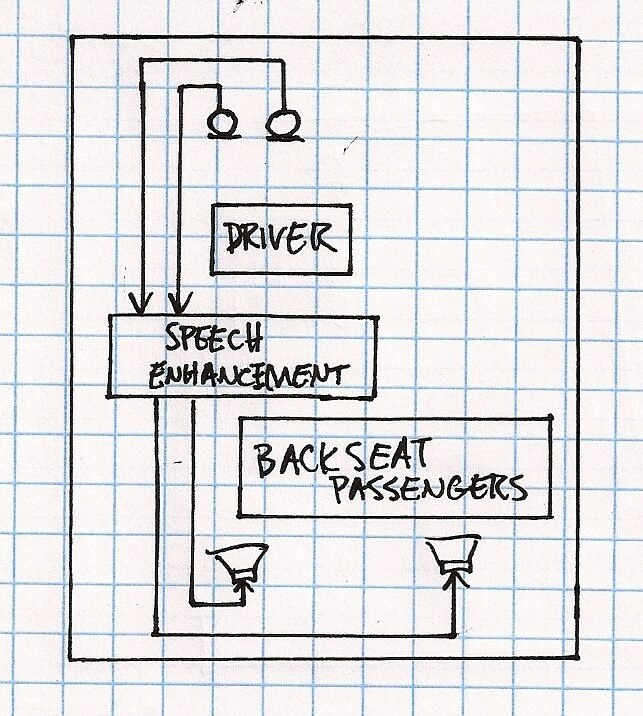 In-car communication is one example of many low latency systems with a speech enhancement need. If you have a low latency speech enhancement requirement, contact us today to learn more about our optimized noise reduction solutions.